A picture of an older woman in a rocking chair holding a child. 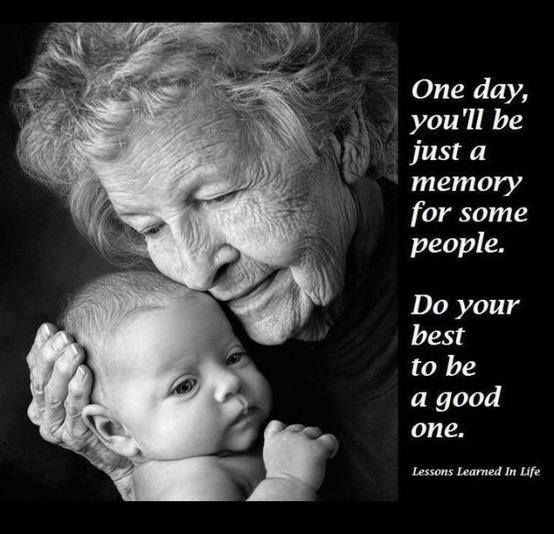 The caption reads: “One day you’ll be just a memory for some people. Do your best to be a good one.” Because I’m older and recently retired, I’ve been thinking about memories a lot lately. Senator John McCain tried his best to be a good memory. Regardless of his politics, I admire his sense of duty combined with a passion to fight for the causes he believed in. What impressed me was his request for Barak Obama and George W. Bush, from two different parties, who each bested him in a Presidential election, to give the eulogies at his funeral. This symbolizes what I admire about Senator McCain: an ability to forgive and move on, always looking to a brighter future. A willingness to forgive and move on. A willingness to forgive and move on says as much about character as any single quality. Forgive and forgiveness is mentioned in the Bible well over a hundred times. When asked if forgiving someone seven times was enough, Jesus replies: “No! Seventy times seven which is taken to mean, no limit. There is nothing easy about a willingness to forgive and move on but the memories formed? Priceless. Years ago, I attended a funeral for a pastor who served faithfully for over 30 years. People from each of his churches were there along with pastors and friends from the ministry. At one point during the service a microphone was set out for anyone who wished to speak. There were many wonderful stories about the pastor and his wife but there was one woman who said something, I will never forget. A comforting glow that helps you feel loved by God. To have a glow displays a love and acceptance that helps anyone who meets you feel loved by God. For me, the glow is symbolic of a life devoted to strengthening your relationship with God and others. The glow doesn’t just appear in certain people, it is actually reflective of ay life that is changed and molded by God. Anyone can have the glow, anyone. That same week, I attended a retirement service for a pastor who also served faithfully for many years. Once again, there were people from each of the churches she served. One spoke with pride of the many people who started attending the church after she arrived and how lives were changed. Mostly they talked about the new ministries started in the community which are still active and meaningful today. Starting something new that lives on after you are gone. Starting something new is a reminder that God has a unique purpose for each us. Our task is to discover what the purpose is and then seek God’s help to accomplish it. Start something new is the challenge that gives our lives meaning and gives God an opportunity to work miracles. Start something new encourages stepping away from what is comfortable and doing something different and significant. Making good memories is about learning to use the fruit given to us by God. Our devotion to modeling God’s fruit: love, joy, peace, patience, kindness, goodness, faithfulness, gentleness and self-control makes it easier to focus more on your relationship with God and less on the hurts and wrongs that are inflicted on you. How does that produce good memories? A willingness to forgive in anticipation of a brighter future tends to give you a certain glow that can’t help but attract others. Discovering why God put you on this earth often leads to a desire and the courage to become more involved with helping others which often leads to starting something new or transforming something that needs improvement. Be willing to forgive and move on.